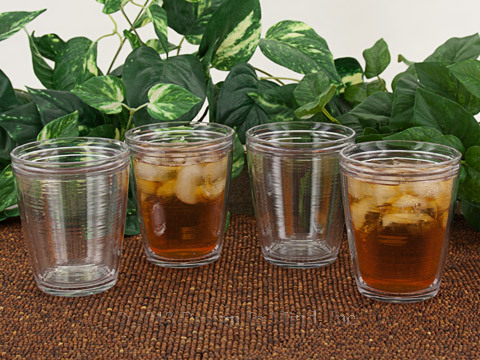 Polycarbonate drinkware is perfect for any cold summer beverage. Unbreakable and dishwasher safe. Hand blown borosilicate non-leaded thermal glass. Insulates hot and cold. Available in two sizes. 14 oz. with a removable silicone base. (7" high) and 8 oz. (5" high). Dishwasher and Microwave safe. Gift boxed. 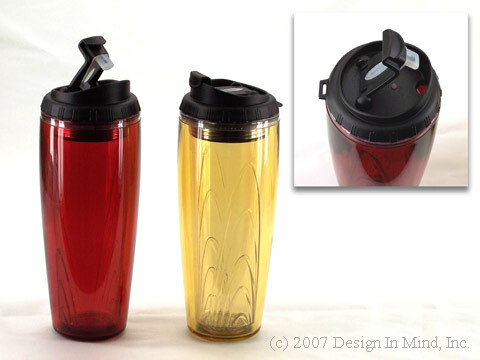 Double wall insulated tumbler set works really well to keep cold drinks cold longer and hot drinks hot longer. Reduces condensation on outside of tumbler. Tumblers are 4.5" tall, 3.75" diameter at top rim and comfortably hold 14 oz even though the packaging says they are 16 oz cups. Resists cracks and chips. BPA free NAS acrylic. Top rack dishwasher safe. Made in the USA. Double wall insulated tumbler. Double wall construction to keep cold drinks cold longer and hot drinks hot longer. Reduces condensation on outside of tumbler. 22 oz capacity, 7" tall, 3.75" diameter at top rim. Resists cracks and chips. BPA free NAS acrylic. Top rack dishwasher safe. Made in the USA. 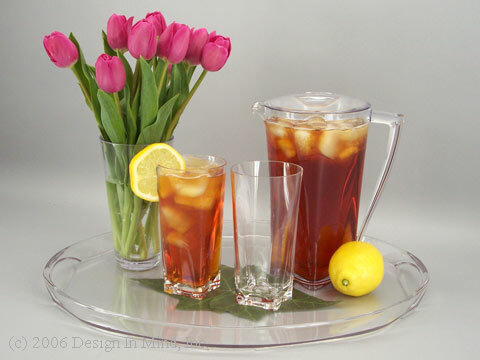 Serve your iced tea and summertime beverages in this pitcher, tumblers and tray in a fun iceblocks design. 64 oz (2 qt) pitcher comes with lid. 11 1/2" tall. 22 oz Tumbler. 6 3/4" tall. Sold individually. 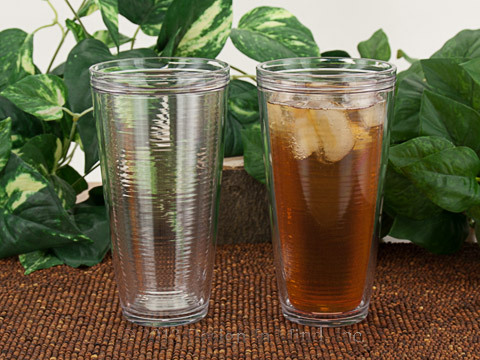 Enjoy your favorite iced tea or summer beverage in this substantial tumbler. Large 26 oz clear polycarbonate. Unique design has a smooth exterior and ribbed interior. Easy care polycarbonate resists cracks and chips and is dishwasher safe. 7 3/8" tall. Sold individually. Made in the USA. 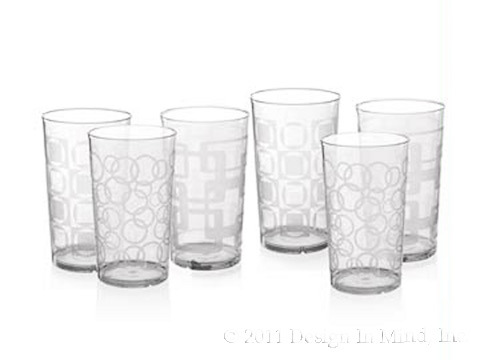 Atlantis Tumblers (22 oz) Set of 8. Large 22 oz BPA free acrylic tumblers in four bright summer colors. Resists cracks and chips. Lightweight and top rack dishwasher safe. Set of 8 includes 2 each of yellow, green, fuschia and turquoise. 7" tall. 3.5" dia. Great size for iced tea. Made in the USA. Atlantis pitcher and tray each sold separately. 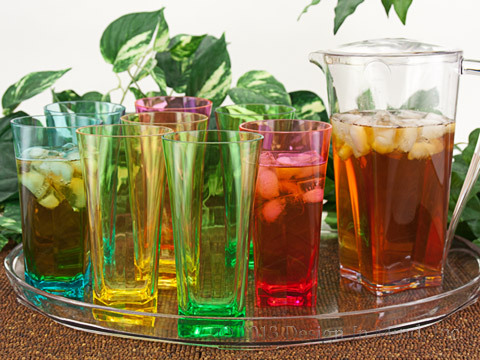 Summertime beverages will sparkle in this clear polycarbonate beverage set. Polycarbonate resists cracks and chips. Lightweight and dishwasher safe. 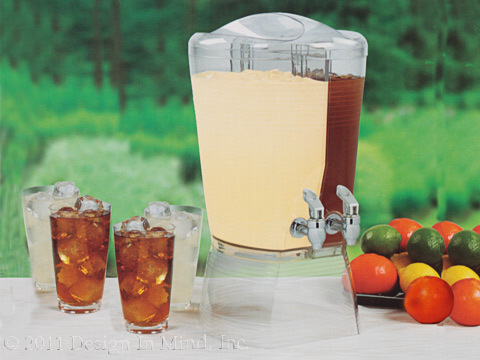 64 oz (2 qt) pitcher comes with lid and is 10" tall. Tumblers hold 22 oz. and are 7" tall. 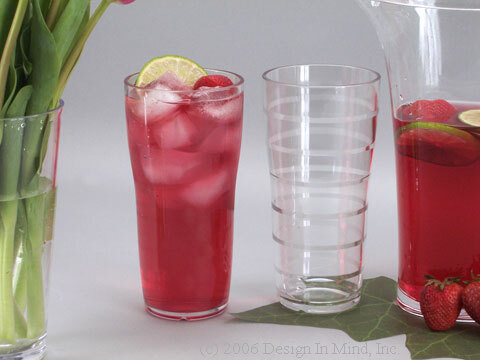 Great for iced tea. Sold individually. Tray no longer available. Made in the USA. See also the matching colored acrylic set above. 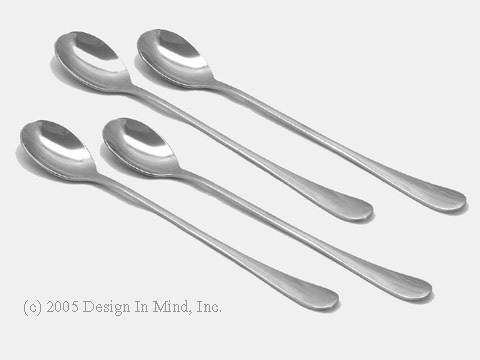 Heavy, 8 inch long, stainless iced tea spoons from Italy. Simple and elegant. The nicest we've found! 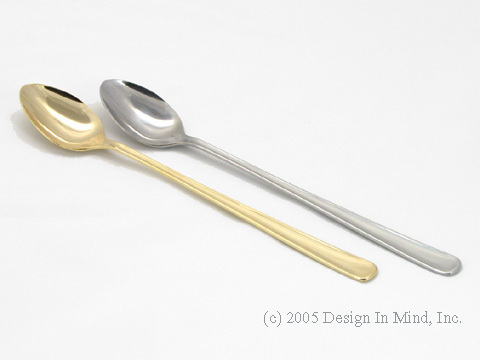 7 1/2 inch stainless steel iced tea spoons are available in bright stainless or gold plated finishes. 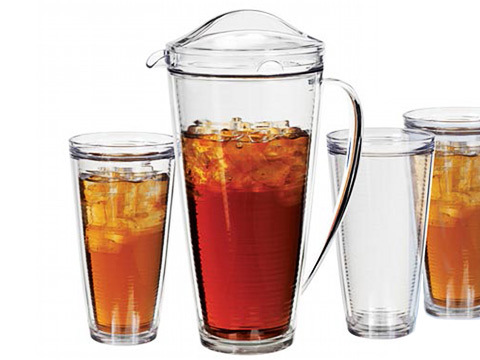 Glass Beverage Pitcher 2L, 66 oz. 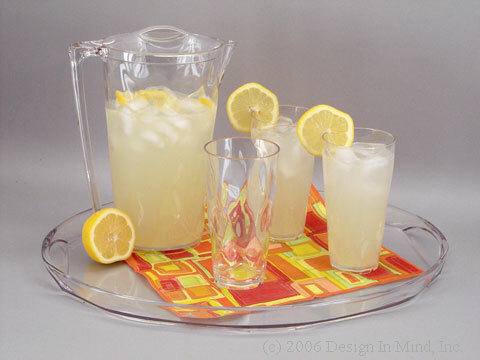 Summertime beverages will sparkle in this clear glass beverage pitcher. Lightweight and dishwasher safe. 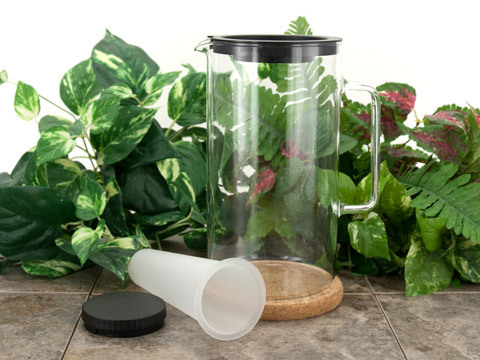 66 oz (2 ltr) pitcher comes with lid and ice tube and is 10" tall. 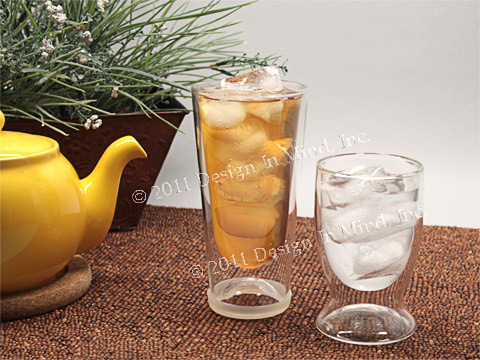 Great for iced tea. Made in the Czech Republic. Large 24 oz clear tumbler set. Set includes 2 each of 3 different designs. Easy care polycarbonate resists cracks and chips and is dishwasher safe. 6" tall. 3 1/2" diameter at top. BPAfree. Made in the USA.